I would guess that the majority of Cat35ers probably like to climb the 4 mountains that require two ascents differently each time. Not me… not this time anyway. 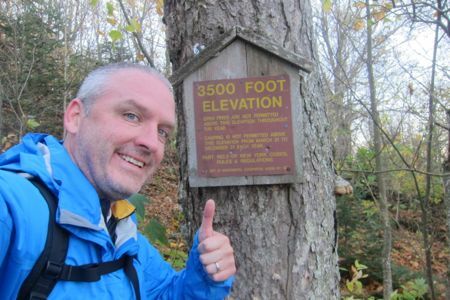 Although I had “just” climbed Balsam back in February, I was determined to repeat the same route so that I would not hate Balsam Mountain for the rest of my life. Sunrise near Belleayre Ski Resort on the way to the trailhead. Go read my winter ascent of Balsam here. Due to the weather (icy pouring rain) and the trail condition (deep but soft and sodden snow), I did not have too much fun that day. As you can see, the weather was a bit better for my non-winter official ascent of Balsam. And I wanted to rip up and over and down the mountain fairly quickly too, for I had other new-to-me mountains to climb! 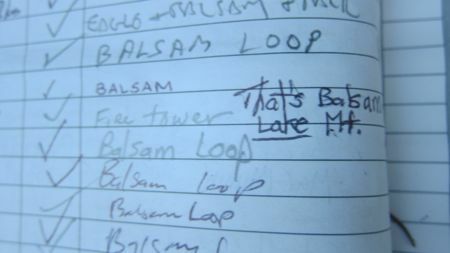 And apparently Balsam Mountain was new to this guy in the trail register. 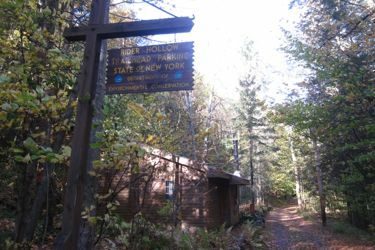 He noted he was on his way up to “the firetower,” which another, later hiker kindly pointed out is on an entirely different mountain called Balsam Lake Mountain. Oops. I hit the trail around 7:30 and just kept laughing to myself at how wonderfully easy this hike was compared to what it was for me back in February. I chose to do the clockwise loop again. The nice slope up the creek for the first mile or so is pleasant and pretty. 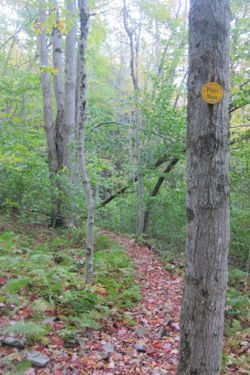 I hit the hemlock grove before I knew it and was positively giddy as I made my way up to the ridgeline. The trail was easy to follow and even the two or three cliff scrambles were fun. 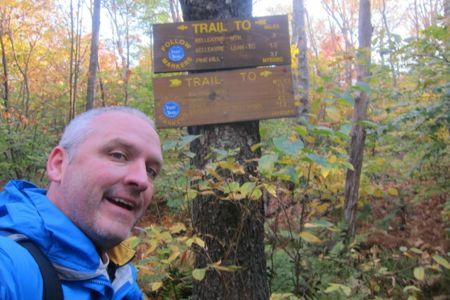 When I reached the junction with the Pine Hill Trail, I was still smiling! 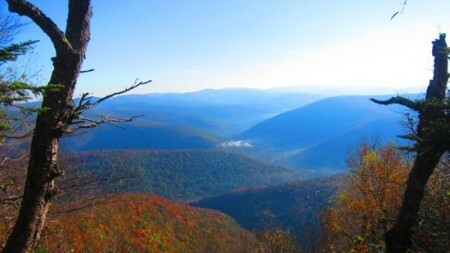 From that point, the trail follows the ridgeline generally south. It is nearly flat for a few minutes, which are a wonderful few minutes. I was nearly running, reveling in the warmth and dryness of my hike! I could have sung! And at the 3500 foot elevation market, just look at me! But, as you could guess, the trail does turn upwards as it nears the summit ridgeline. Nothing too bad, but it enough to keep you from singing at the top of your lungs. The summit here isn’t really easy to discern, but I just say that hiking down the trail down the longer summit ridge suffices here. I stopped for a few minutes at the stunning viewpoint. Here’s the amazing thing: back in February, I didn’t even take a picture here. Not one .I just hiked by it. I do remember looking at it and thinking, “I should take a picture of that wall of gray nothingness,” but then I realized it was pouring at the time and I was stuck in 3 feet of wet snow, so I didn’t bother. 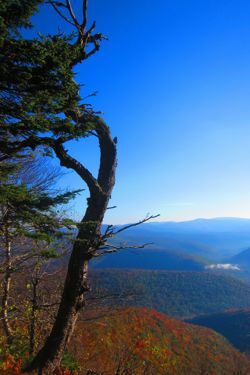 For those of you who choose to hike when the hiking is best, here is what the view east from Balsam Mountain looks like. This is why we hike, people. I skipped to my loo across the summit area and then began my descent back to Rider Hollow. Flashbacks to my Spruce Trap hell in February, but no time to waste. I was flying down the mountain. Like an idiot. 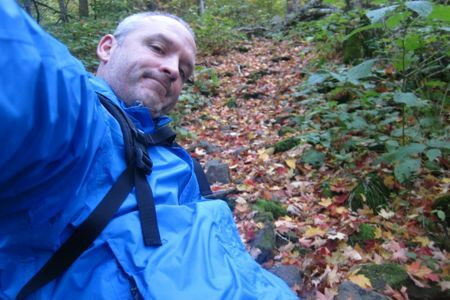 Hiking tip: You WILL slip on wet leaves, so be smart about them and don’t go too fast. Or you will fall and possibly get hurt. Still smiling though! Balsam is a great beginner 35er I’d say. Never too steep (clockwise is less steep than counter, I think) with an awesome pay-off for a view. (Also, if you go clockwise, you avoid the five creek crossings until the end, and it’s better to get your feet wet at the end rather than the beginning of a hike. Past the lean-to and over the nice bridge and back out to my car in just about two hours. 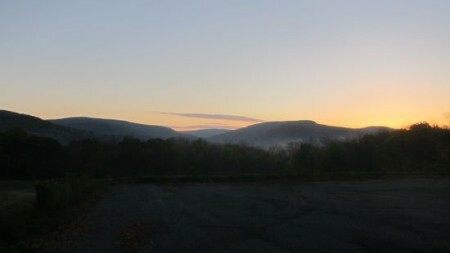 Not a bad way to start a Catskills hiking day.